Movie Ramble: The Deep End. It great to come across a good old-fashioned story, one with a beginning and a proper ending. 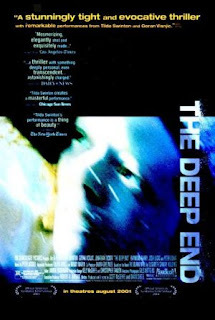 The Deep End (2001) is one such film, you can safely sit in your front room with your chosen refreshments and enjoy a well-acted DVD with a decently thought out storyline. Directed by the regular writing and directing partnership of David Siegel and Scot McGhee, loosely adapted from the novel The Blank Wall by Elizabeth Sanxay Holding, a novel that was previously filmed in 1949 as The Reckless Moment starring James Mason and Joan Bennett. The latest adaptation’s central figure is middle class housewife and mother Margaret Hall, another outstanding performance from Tilda Swinton who was nominated for a Golden Globe Award for Best Actress for this role. Swinton’s character is a resourceful and single-minded woman tasked with bringing up two children and looking after her father-in-law while her absentee husband is constantly away serving in the US Navy. She is extremely worried about her teenage son Beau who has just been involved in a car crash while driving back from The Deep End, a Reno nightclub, under the influence of alcohol. His passenger was the 30-year-old owner of the club; Darby Reese whom Margaret suspects is having an affair with her son. She visits Mr Reese at his club and attempts to persuade him to stop seeing Beau. But when Reese visits Beau at the family home late one night it ends in disaster. Margaret discovers the visitors body the next morning and its her attempts to cover up the death, to protect her son, that leads her into a cat and mouse situation involving a couple of unsavoury characters (one of which was played by the Croatian actor Goran Visnjic) and an incriminating video tape. It’s an unusual Hitchcockian type crime thriller very involving and appealing, cleverly scripted and directed which basically asks the time-honoured question how far is a mother prepared to go to protect her family? But I must say without Tilda Swinton’s formidable acting skills it would not be quite so satisfying.